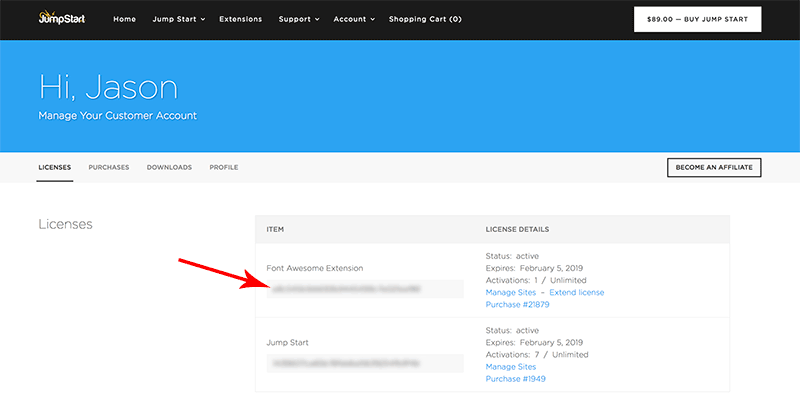 When running Jump Start Extensions, you can receive in-dashboard updates through your WordPress admin panel directly from Theme Blvd servers with an active license. After you've activated your license, you will be prompted in the future from the Plugins screen to update when a new version is available from Theme Blvd servers. Here are the steps to activate your license from your WordPress admin panel. 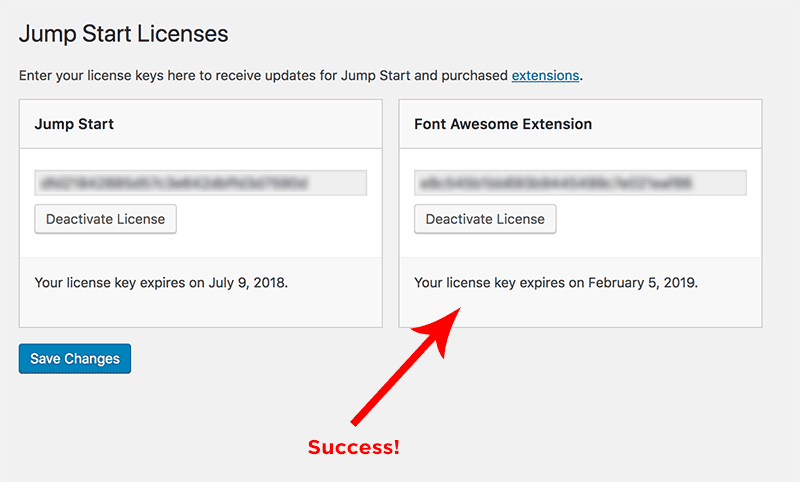 Log in to your account wpjumpstart.com and go to Account > Licenses, and copy the license key that corresponds to the extension you've purchased. 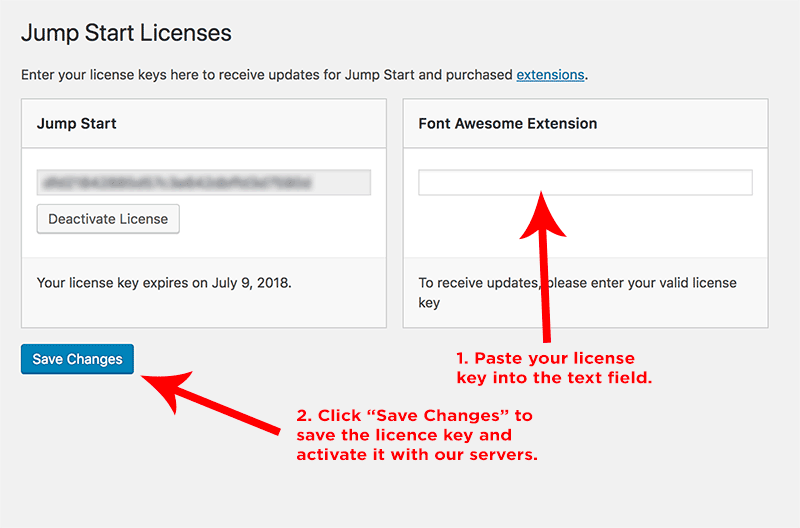 In your WordPress admin where you have Jump Start running, go to Appearance > Theme License, paste in your license key, and click, "Save Changes." This will save your key and activate it with our update servers. 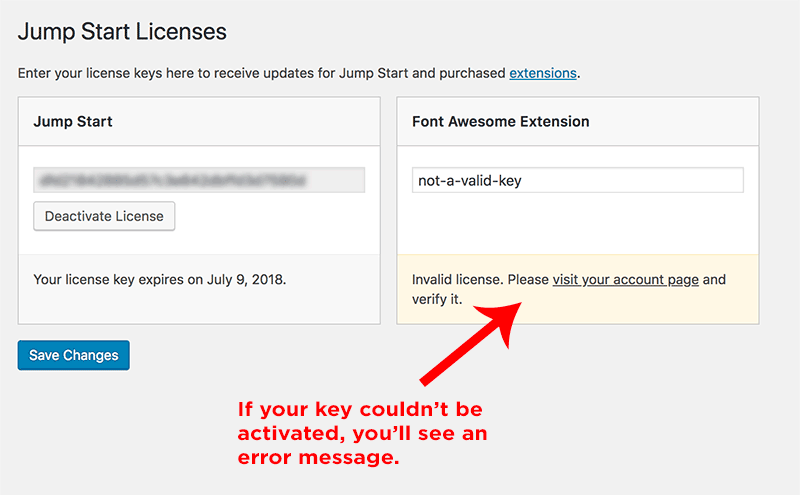 If your license key was successfully activated, you'll see a message similar to the following screenshot. And if there was an issue validating or activating your license key, you'll see a highlighted error message. After this is set up, you can make updates to the theme in the same way you would with any other plugin, from the Plugins screen. What can I do if my Jump Start license is valid but updates aren't working? 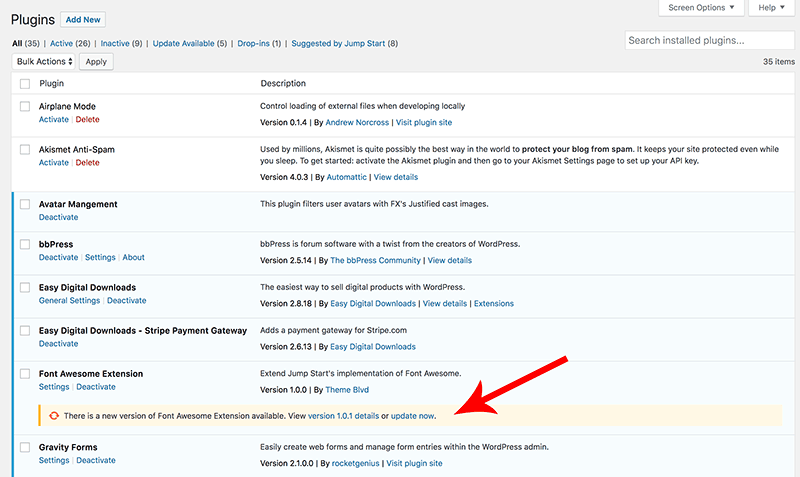 For making manual updates to an extension, you can download the latest version of the plugin from Accounts > Downloads at wpjumpstart.com, while logged into the account you setup when you made your original purchase. Once you've downloaded the plugin's ZIP from your Downloads page, unzip it, and upload the resulting folder to /wp-content/plugins/ of your WordPress installation, replacing the previous version. This is most commonly done through FTP.